Future Directed Therapy | Stop talking about your past and start creating your future. Future Directed Therapy is effective at reducing symptoms of depression and anxiety and can improve your overall quality of life. Feeling overwhelmed or fearful can impair your ability to cope. Future Directed Therapy can teach you how to overcome your fear and achieve your goals. Future Directed Therapy is designed to teach you the skills you need to succeed in life. When you know how to control your emotions and achieve what you want, life doesn’t seem so overwhelming. Future Directed Therapy can teach you how to live life with a greater sense of peace, awareness, and purpose. Future Directed Therapy™ (FDT) is the first psychological intervention developed based on the understanding that the brain operates in a primarily future-oriented anticipatory way. The majority of the actions we take and the emotions we feel are a result of what we expect will occur, and as a result your life is determined by how you think about the future. Depression can result when we don’t expect enough positive things in the future and Anxiety can occur when we expect too many negative things. Most people have very little understanding of how their expectations create the future and are operating in a default mode often recreating past experiences without even realizing it. 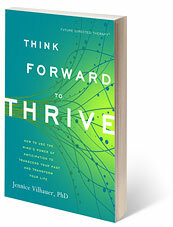 The emphasis in Future Directed Therapy is not to train people to think positively but rather to teach people how to think effectively about what they are trying to achieve in life and as a result create more positive experiences. The ability to transcend your past lies in your present moment awareness to consciously choose how you think about the future.